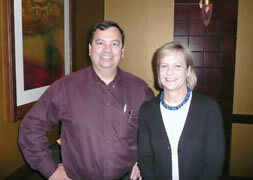 EMC Society Board member Henry Benitez of ElectroMagnetic Investigations catches up with Newsletter Editor Janet O’Neil prior to the Board’s annual dinner in Huntsville, Alabama. While in town, the Board attended the Huntsville EMC Chapter meeting, along with over 100 other people! Read about the Chapter meeting on page 13. The above photo was taken at the November series of IEEE EMC Society meetings held in Huntsville, Alabama. A highlight of the November meeting was the recognition of outgoing Board members and introduction of newly elected Board members. Outgoing President Elya Joffe thanked the outgoing Board members at his last meeting as President in November. The Board appreciates the service provided by our 2007–2009 Board members, including Dave Staggs, Bob Scully, Don Sweeney, Bob Goldblum, Todd Hubing, and Takeo Yoshino. On January 1, 2010, our new President, Francesca Maradei, took office! Her first “President’s Message” article debuts in this issue on page 4. Those Board members newly elected to office starting January 1 are profiled on pages 82–83. This was an especially “fun” issue to put together. In gathering material, the common theme of inductance came up. First, we received the book review on Clayton Paul’s newest book, INDUCTANCE Loop and Partial. I asked Clayton what lead him to write a book on this topic. I wished I had tape recorded the discussion as Clayton relayed a fascinating story going back to 1972. In that year, Dr. Paul read a “brilliant” paper by Dr. Al Ruehli that influenced the course of his career. As an expert on inductance, naturally it was Dr. Ruehli that reviewed Clayton’s book for this issue (see page 75). Of course I had to ask Dr. Paul if that brilliant paper was still available and where it was published. After all, if it had that much influence on one of the leaders in our industry, it must be very special. Learning the paper was published in the IBM Journal of Research and Development, I asked our Design Tips Associate Editor, Bruce Archambeault of IBM, if we could possibly get permission to republish this paper in the EMC Newsletter. Bruce was able to get a positive reply in a timely manner and further added that the paper was indeed excellent and worthy of wider dissemination to the readers of the EMC Newsletter. I thought our readers may be interested in Dr. Paul’s comments on this paper. He kindly offered to write an introduction to the paper which you may read on page 58. I hope you can set aside an hour or so to read Dr. Paul’s introduction and the paper by Dr. Ruehli. I am sure you will find this 1972 paper just as relevant today – over 30 years later! Once Bruce Archambeault realized we had this paper and book review on the common theme of inductance, he joined the bandwagon and contributed his Design Tips column on the topic as well. On page 85 you can read the featured article on multiple decoupling capacitors in printed circuit boards. I’d like to acknowledge and thank our contributors to this special issue on inductance, including Clayton Paul, Al Ruehli, and Bruce Archambeault. I’d like to especially recognize Ken Wyatt for putting a new spin on the topic with his creative cover artwork. I showed a sneak preview of the cover to our new EMC Society President, Francesca Maradei, who is also a scuba diver, by the way, and her reaction was, “It’s beautiful!” I couldn’t agree more! Of course, our other articles in this issue are enjoyable as well. Chapter Chatter has some great information about the Chapter activities around the world, including our newest Chapter in South Africa. Read about the Chapters starting on page 8. I never tire of reading the History articles. Dan Hoolihan does a fabulous job researching our archives and coming up with little treasures of information on the EMC Society’s history. He mentioned recently that the long winters in Minnesota are very conducive to detailed research. I am glad he lives there so we can read the result of his labor. “RFI – the Invisible Killer” on page 34 is a gem! Incidentally, in his spare time, Mr. Hoolihan is our Society’s representative to the IEEE’s Committee on Man and Radiation. He provided an update on this activity on page 88. Antonio Orlandi organized two book reviews for this issue, starting on page 74. One as mentioned above covers Clayton Paul’s new book. The other book review covers Rachidi and Tkachenko’s work on transmission lines. Their excellent book was published in June 2008; we have been remiss in not publishing the book review sooner. Many thanks to Professor Orlandi for bringing this book to our attention. Members of the EMC Society tell us that practical papers and updates on EMC standards are some of the most valuable reasons to retain their membership. In this issue, Professor Canavero brings us two very interesting practical papers (starting on page 46) while Don Heirman keeps us up to speed on global EMC standards activity (starting on page 71). We received many emails from readers letting us know the sad news on the passing of Georges Goldberg, a very active contributor to the development of EMC standards. Mr. Heirman has provided a tribute on page 73 to the tremendous contributions made by Georges Goldberg, the recipient of the IEC’s prestigious Lord Kelvin Award in 2000, with input from Michel Ianoz. Above, Mr. Heirman provided a tribute to the late Ralph Calcavecchio, another legendary figure in EMC standards. Ralph will be missed for his energetic dedication to EMC standards. Be sure you read to the very end of this issue! You’ll find surprises on the EMC 2009 surplus symposium registration bags and the answers to the Jeff Silberberg photo quiz. The Calendar section was considerably updated so you can plan to attend some great upcoming EMC events around the world.